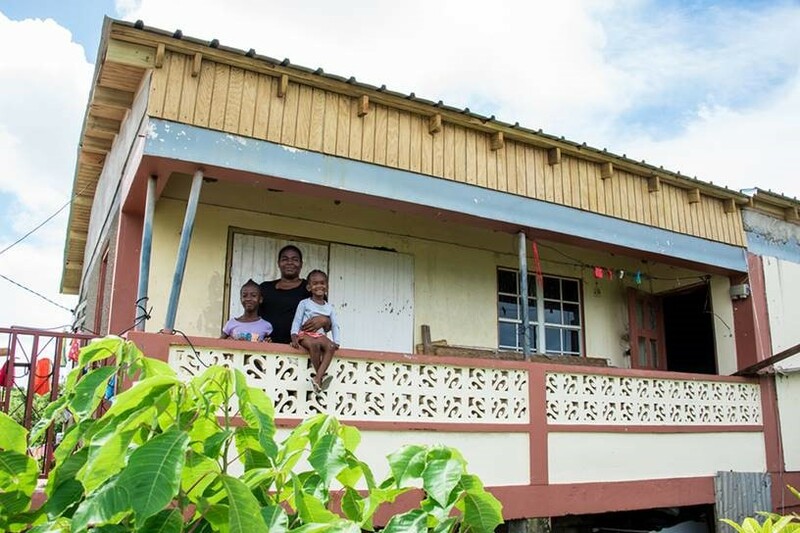 Roseau – Over 500 families who lost their roofs and nearly everything else after Hurricane Maria have received assistance from the UN Migration Agency (IOM) to rebuild stronger, more resilient roofs. An IOM contingent arrived in Dominica less than two weeks after the Category Five hurricane decimated Dominica on 18 September 2017, damaging or destroying 90 per cent of the housing stock. Almost a year after on, Dominica is still struggling to return to normality. Most of the country has been reconnected to the national water and power grids, schools have reopened, and the government is working to become the world’s first climate resilient country. Notwithstanding, if the array of houses covered in tattered tarps, the piles of distorted galvanized sheets at many bends or the ghosts of abandoned homes and businesses littered around the country are any indication, there is still a great deal of work to be done. Wyzelle Philogene, a mother of three, admitted that she didn’t take proper precaution and was still at home cooking and doing domestic chores when the hurricane hit the island. That disregard was quickly replaced by fear as she scrambled to keep herself and children safe as Maria’s strong winds and heavy rain wreaked havoc. Looking at her house the day after, she said she felt “heartbroken”. “The house looked like a total disaster. There was no roof, no door, part of the house at the front gone, most of the stuff inside gone. There was stuff that I bought just before the storm, and I lost all of it. My television, I bought it on the Friday before the storm, and I lost it. It was a package. The fridge, the stove, and television, I lost all of them,” she disclosed. For almost a month, she and her children lived at a friend’s house with about 10 to 15 other people. Though homesickness crept in, gratitude for the kind hospitality overrode those feelings, and the mother and children did their best to manage under the circumstances. When it was time to return home, she found herself under tarps and shortly after, under patched, damaged, discarded galvanized sheets. “Whenever rain fell you had to get buckets and containers to collect water. It wasn’t the same, but we had to cope, we had no choice,” Wyzelle said ruefully. With the guidance of vulnerability criteria provided by the Ministry of Social Services, and the help of her village council and a special beneficiary selection committee, Wyzelle qualified to receive humanitarian assistance from IOM. In less than a week her leaky sheets were replaced with a brand-new roof. “I love it, to be honest. At first when I came here it didn’t have rafters, it was just galvanize, but now I have exposed rafters so, I have to be thankful for that. I appreciate it more than enough because to have people like that – they don’t even know you, they don’t even know your needs, and to go out of their way to help you and to put a brand-new roof over your head at no cost. I really appreciate it,” she affirmed. Emergency shelters still house families who have not been able to return to a normal life in what remains of their homes. Many houses simply disappeared. Emergency shelters across the island were damaged, and most have not yet been repaired. IOM has been able to assist with housing needs in 11 communities so far, repairing or re-building roofs and wooden core houses with funding from UK Aid, the European Commission’s humanitarian agency (ECHO), the Government of Australia, and contributions from ChinaAID via the UNDP. Even though the milestone of over 500 families assisted is celebrated, there is still room to do more. IOM currently employs over 150 people across Dominica; only three are expats. The economic impact of this is significant through wages and salaries, casual pay, rental of vehicles and accommodation, and procurement of goods and services. With Dominica being one of its newest member states, IOM is building capacity for a long-term presence on the island, positioning to be an active partner to the government and people of Dominica in a quest to build better homes, communities, and improve lives across the island. For further information please Contact Maxine Alleyne-Esprit at IOM Dominica, Email: malleyne@iom.int Tel: + (767) 275-3225.